Spot silver continues its meteoric rise, tracking silver futures higher, and closing yesterday’s trading session once again with an up candle making it a 5th straight day of gains in a row. Indeed today looks as though spot silver will extend this bullish run further, making it six consecutive days of gains as we trade higher at $20.88 per ounce on the daily chart. The bullish trend is fully supported by all the moving averages below and, in particular, from the 9 day average, which continues to provide very strong support along with both the 14 and 40. 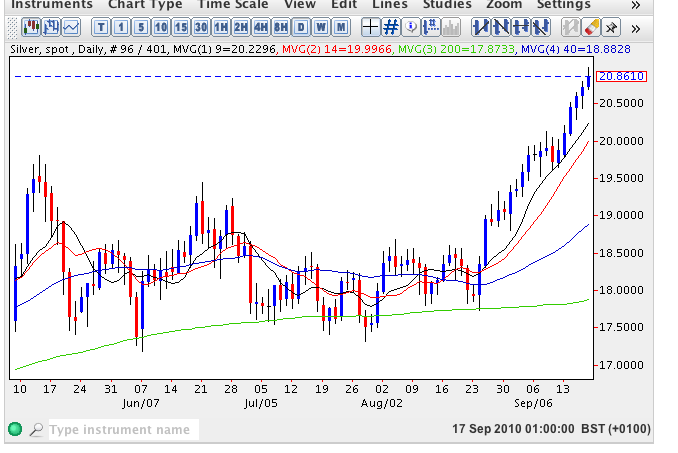 The next target for spot silver is $21.34, a price last seen in March 2008 and should we breach this level, as expected then the commodity is set to continue and develop the bullish trend further, helped by risk on appetite in equities and the pull through effect from gold which has now broken into new high ground.